With the official general availability of Windows 7 is set to October 22nd, 2009, Windows 7 RTM (Released to Manufacturing), the final code piece that going to be released, has also likely to be finalized soon. It’s almost 2 weeks ago since Windows 7 Build 7260, also on RTM branch, was leaked to Internet as VHD image, and now finally a newer Windows 7 Build 7264, in original untouched and unmodified ISO image format, is leaked. However, Windows 7 Build 7264 is likely not to be the final RTM build, as a show-stopper bug been found when it’s a candidate for RTM. 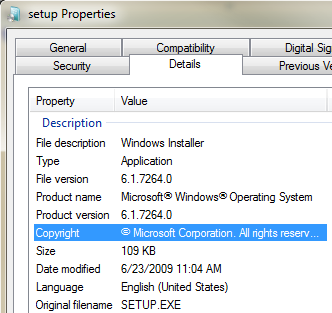 Besides, an even newer build such as 6.1.7265.0.win7_rtm.090624-1905 has been known to be compiled by Microsoft. However, it’s the latest build to available to general public for free download. Both 32-bit (x86) and 64-bit (x64) of Windows 7 Build 7264 is available with complete build string of 6.1.7264.0.win7_rtm.090622-1900. So the build was compiled and signed off on June 22nd, 2009. Windows 7 E Build 7264 is also available for download. User will need a BT (BitTorrent) client such as uTorrent to download the DVD ISO images via torrent files. Last important note is that Windows 7 RC product keys or Windows 7 Beta product keys no longer able to activate Windows 7 Build 7264. However, Windows 7 RTM is likely to be finalized soon in July, or user can relies on rearm Windows 7 trick to extend activation-free usage. The x86 and x64 MUI language packs for Windows 7 Build 7264 is also available.